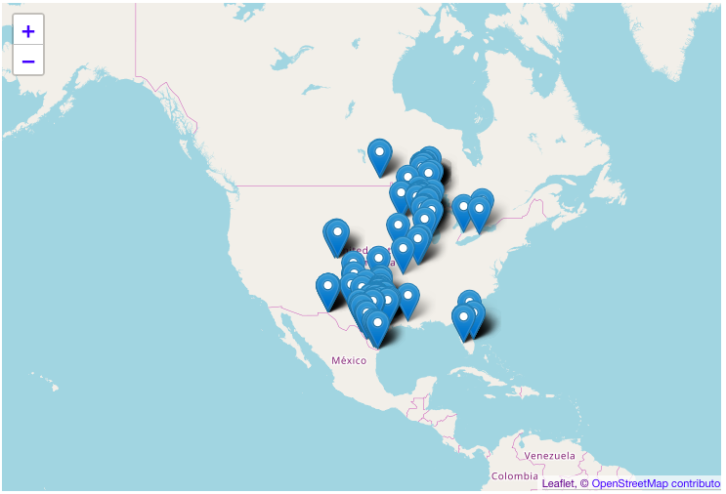 From Central Wisconsin, it takes at least 2-3 hours to get out of the state. With that being said, I rarely left the State of Wisconsin when I was growing up. 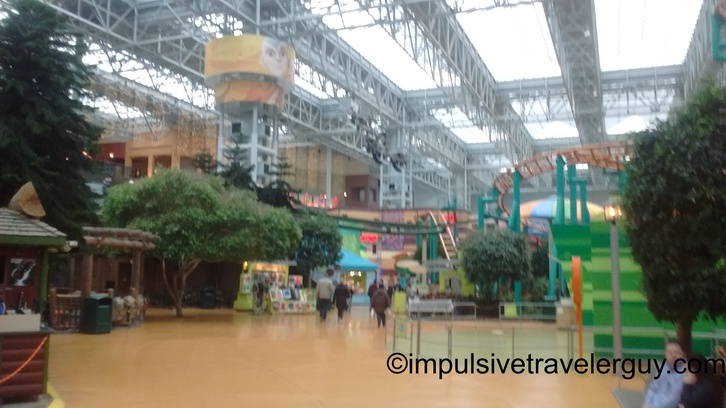 One of the few exceptions was when my mom used to take me to Mall of America in Minnesota. There was a bus service that that would organize tours through her work and then she would either take me or my brother along. 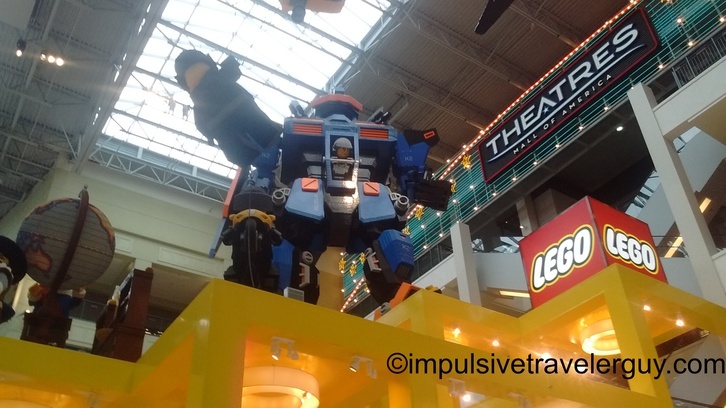 Since I started doing my traveling, I’ve been to Mall of America around a dozen times. I live a minimalist lifestyle and don’t buy or have a lot of things, but it’s always interesting to see what’s for sale as well as people watch. 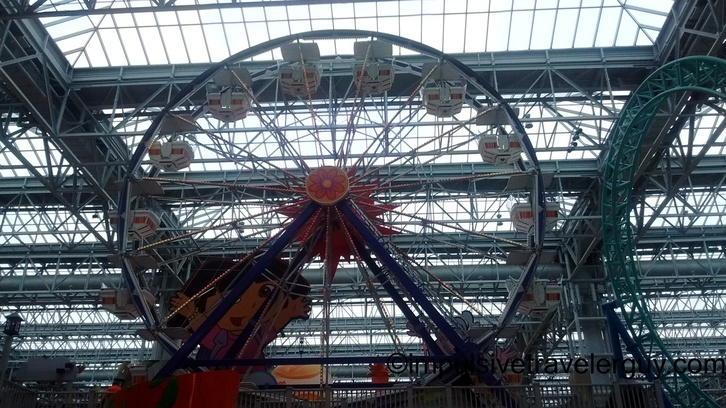 I had been wanting to get to Mall of America on one of my trips up to Wisconsin, but never really had the time since there were other places I wanted to go more. 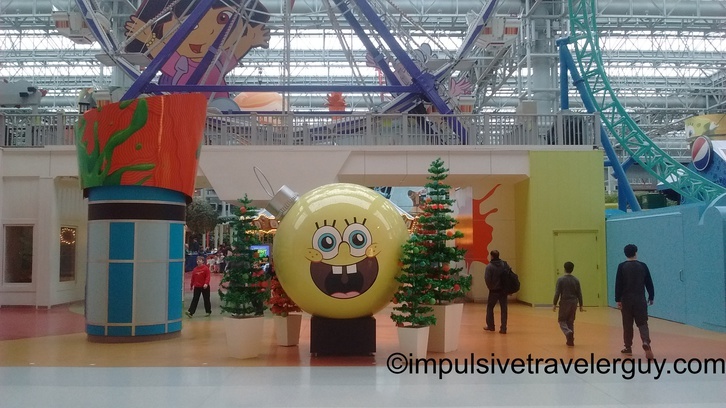 Since I was going to be in Wisconsin for an extended Christmas break, I decided I finally had some time to visit Mall of America. I figured I would do it sometime after my trip to Copper Harbor. I mentioned it to my parents and my mom wanted to go with me just like we used to in the past. She had a day off on the following week, so we decided to go then. We decided to hit the road early. It was supposed to storm and we want to get back before the storm hit. 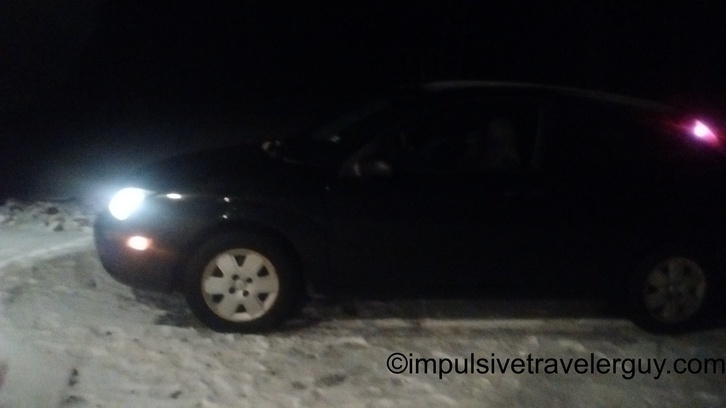 It was definitely a bit cold and I had to wait for my car to warm up a bit so it could defrost the windshield. 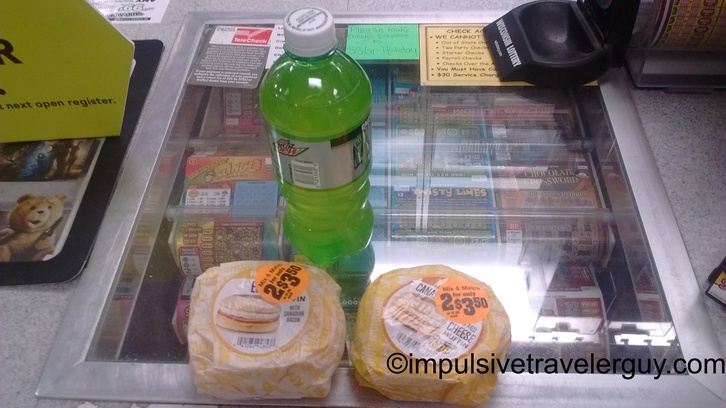 Once we hit Neillsville, I decided to pick up some breakfast. At the gas stations there was some interesting things for sale. 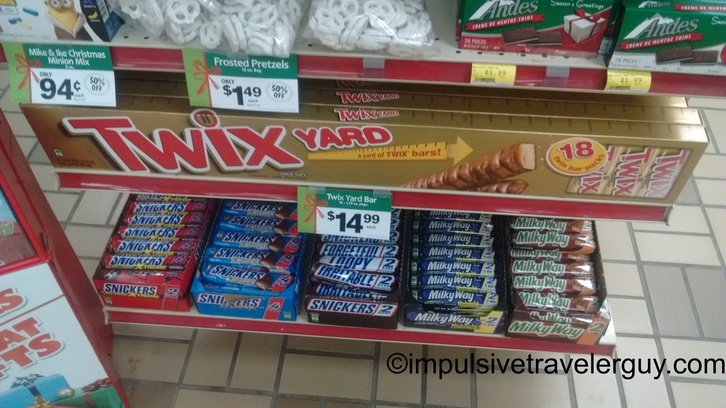 I never knew you could buy a whole yard of Twix. They also had an interesting beer display. 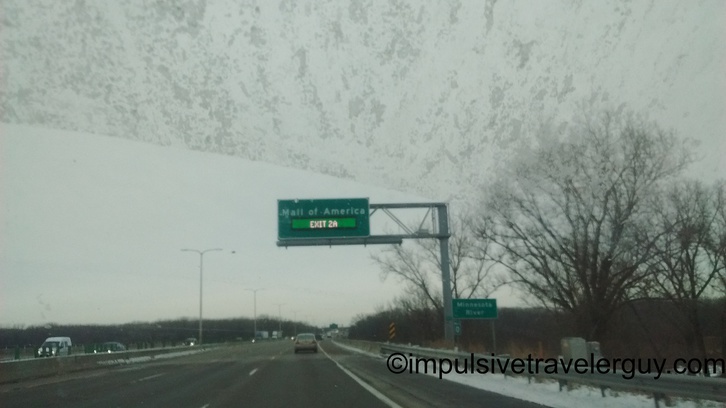 After a bit of driving, we finally hit the Minnesota border. 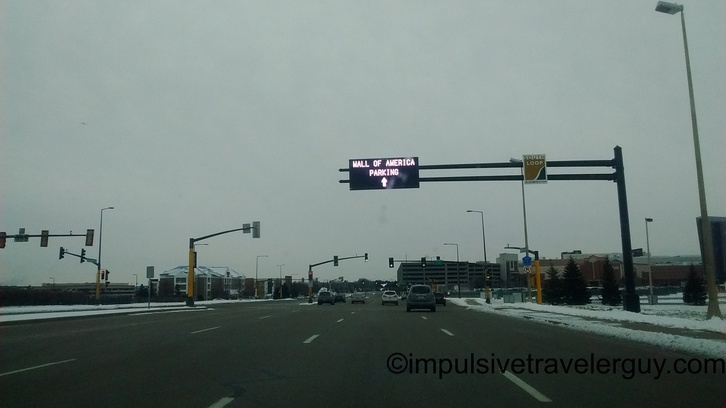 After a little more driving, the exit signs for Mall of America started to appear. There were also signs directing us to the parking. 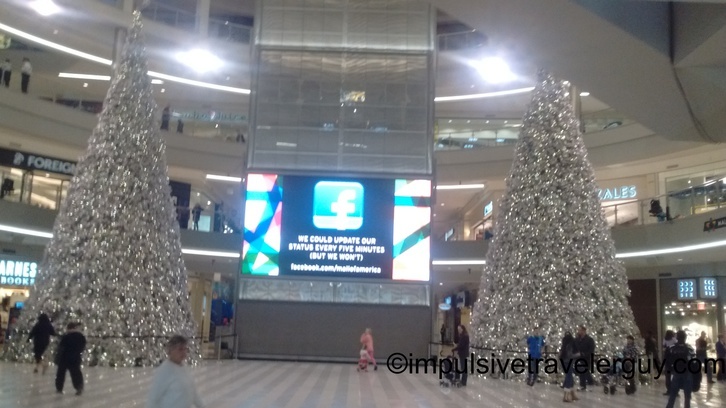 We made it to the front of Mall of America. 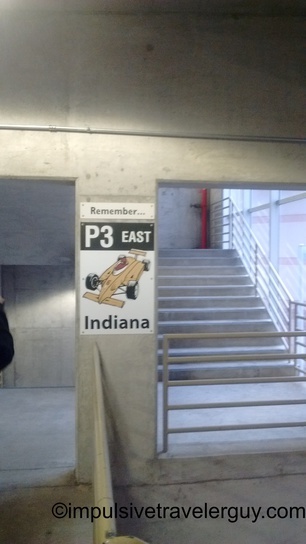 I decided to park in the Indiana lot. This is the lot I usually park in. 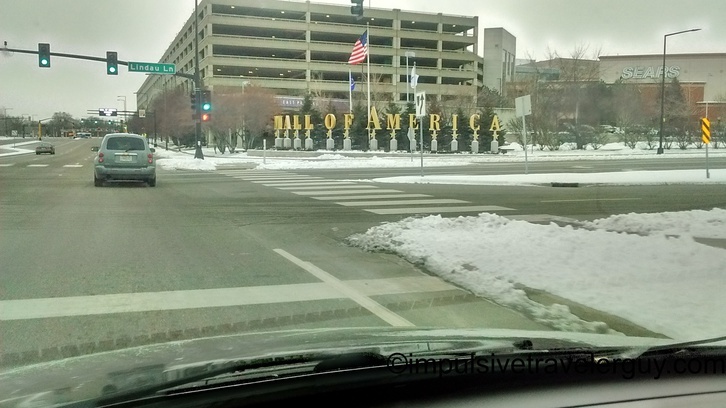 I took a picture to make sure I knew exactly where I parked. This parking was right by Sears. We went to try to walk in and the doors were locked. I’m not sure if it was because there was rumor that a Black Lives Matter protest was possibly going to happen or what was going on. Their signs said they were open but their doors were locked. Now with it being cold, this was no fun because we left our jackets in the car due to the fact that inside the mall was warm and we’d be walking around and would ultimately have to carry the jackets because we’d be too warm to keep them on the whole time. We walked around to another entrance and finally made it in. 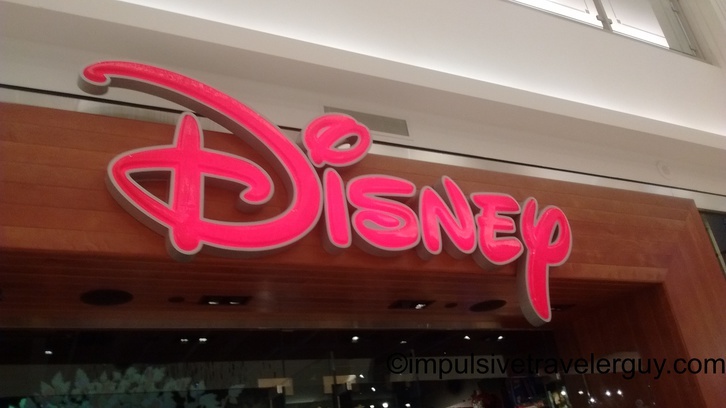 I decided to snap a picture of the store we were by so I had a reference when it came time to leave. 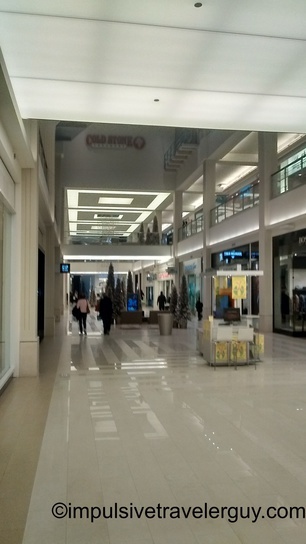 What I figured the most efficient thing to do is walk circles around the mall since it went in a full circle. 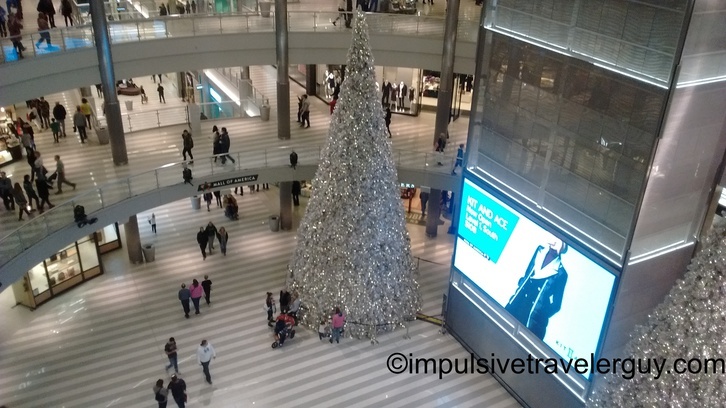 We’d use these large Christmas trees as reference to know we made a full circle and we could move to the next floor and explore the stores there. 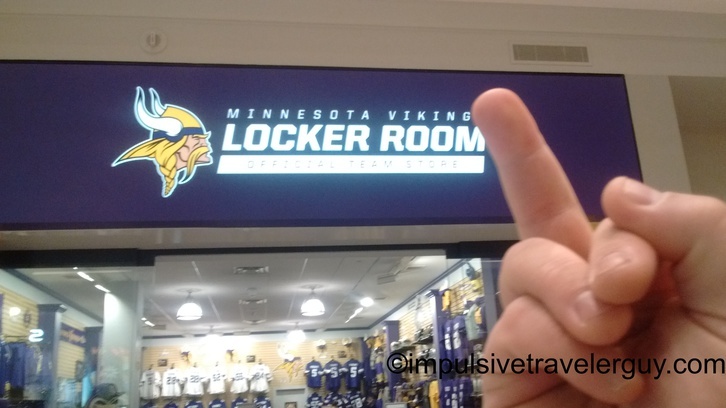 One of the first stores I saw was the Minnesota Viking’s locker room. Being a Packer fan and also wearing my Packer’s shirt, I had give it the one finger salute. The guy working there was laughing as I did it. We got there somewhat early. 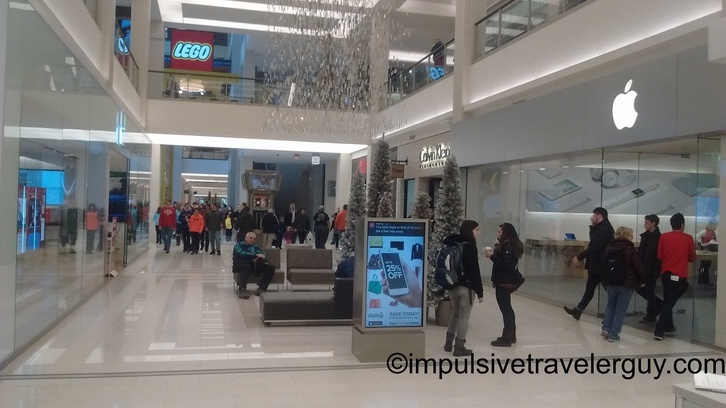 The mall itself wasn’t too busy. 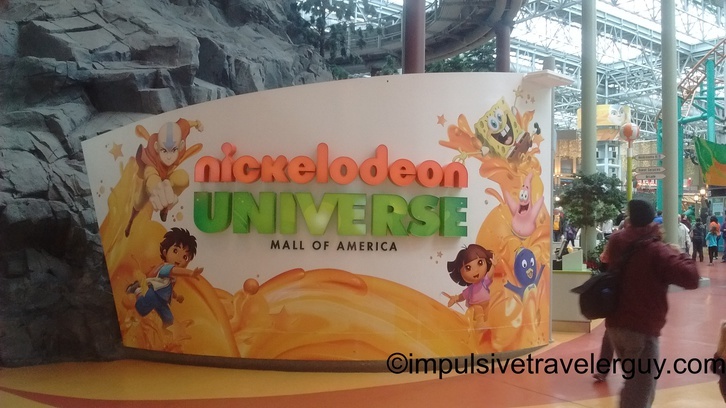 Pretty much every major brand is represented at Mall of America. 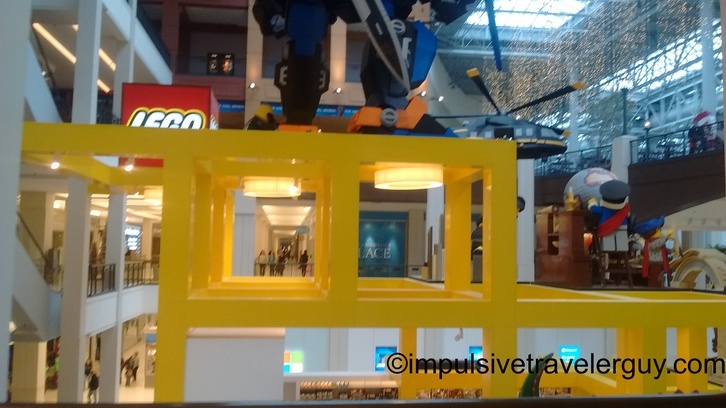 Of course, Legoland is a huge attraction. These are some views from the first floor. Ironically, the Apple and Microsoft stores are right across the hall from each other. 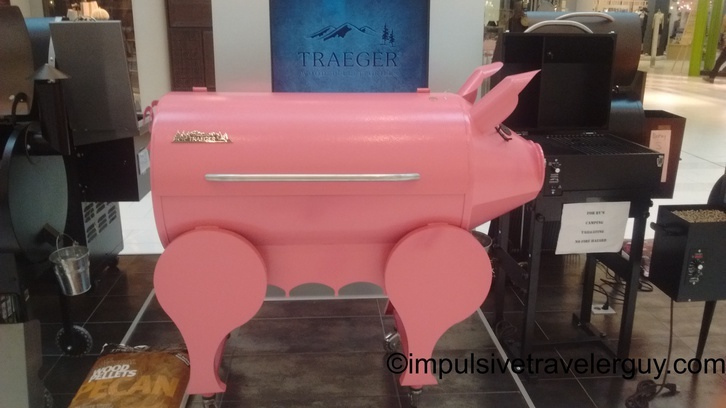 There are also some interesting things like a pig BBQ in the middle of the aisle. 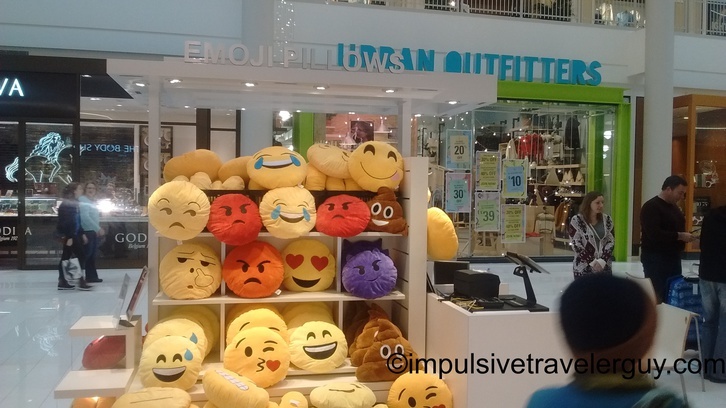 There were several vendors selling emoticon pillows. 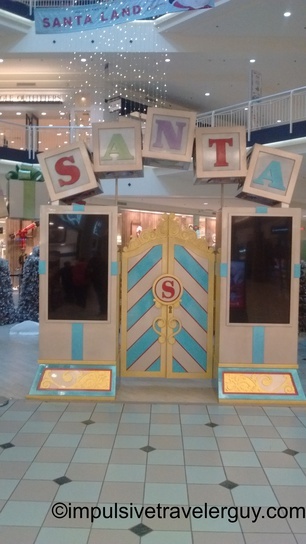 There was still some leftover stuff setup from Christmas. 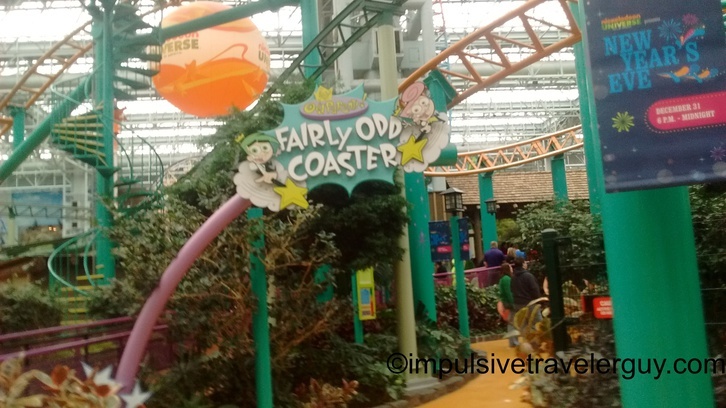 Nickelodeon Universe, which used to be Camp Snoopy when I originally started going to Mall of America is kind of cool since it’s an indoor amusement park that isn’t vulnerable to the cold Minnesota winters. 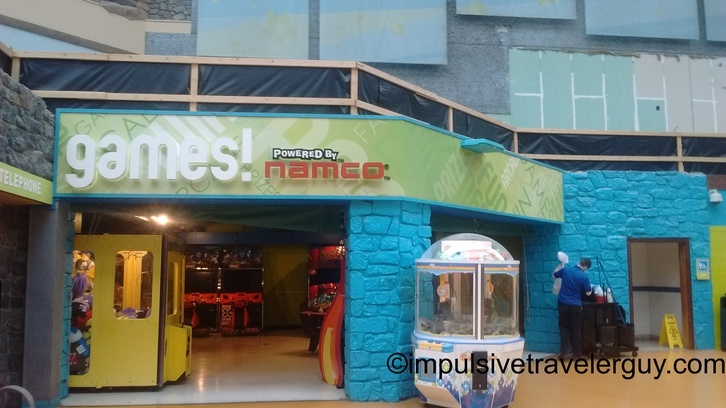 It even had an old school arcade! After the first lap we made it back to the trees. 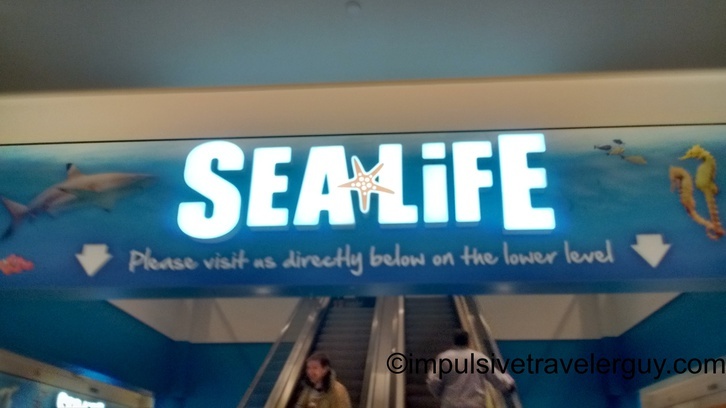 Going up the escalator to the second floor, I saw the signs for Sealife (originally Underwater World). I’ve toured it once or twice, so I didn’t need to spend the money on it. 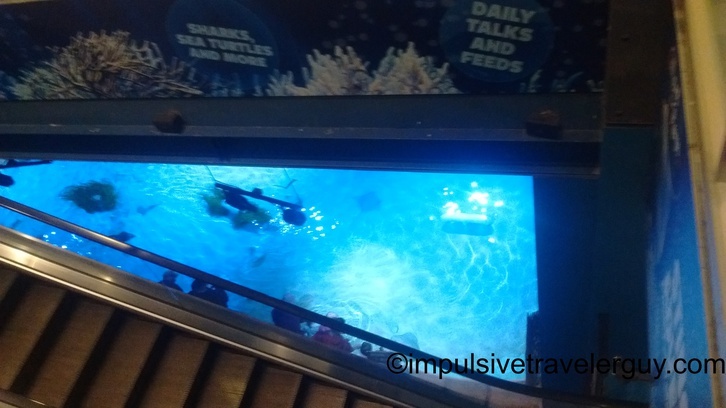 I just grabbed a quick picture from the escalator. 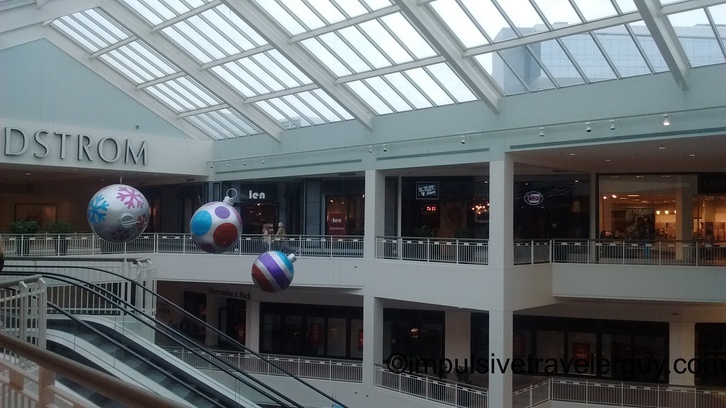 On the second floor, you could see the Christmas stuff hanging. 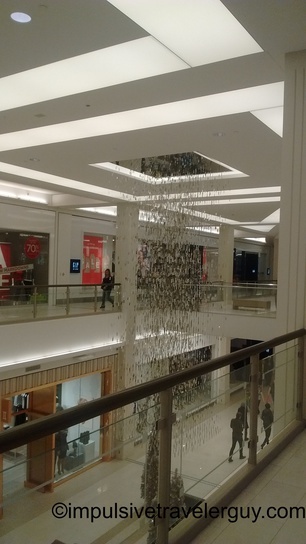 There were also these strands of lights that hung. 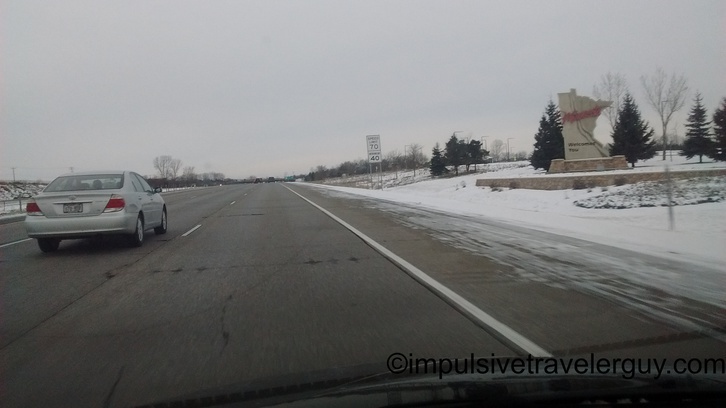 One sign I remember going by is the Mystic Lake sign. 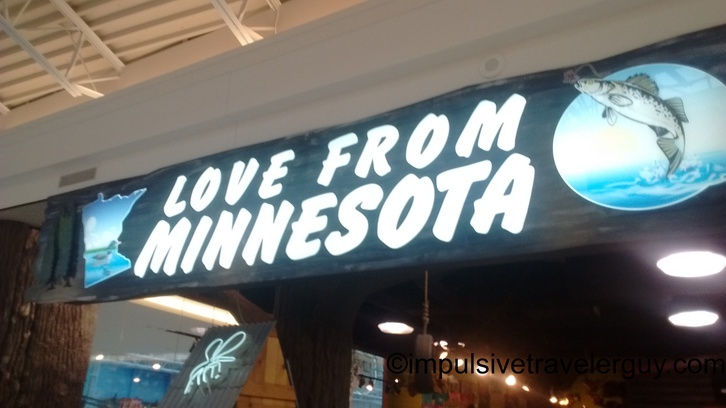 I remember back in the day when we all turned 18 and my buddies wanted to gamble, they would hop the Minnesota border to gamble since Wisconsin’s gambling age was 21 and Minnesota’s was 18. I didn’t go with them often because I am not really into gambling, but it did remind me of the couple times I did ride along with them. 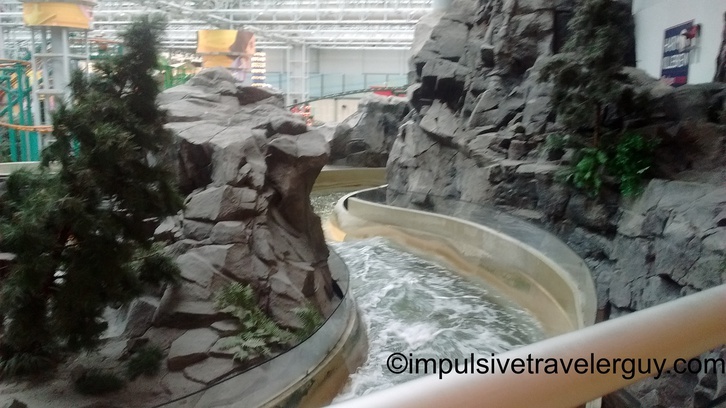 Another view of Nickelodeon Universe from the second floor. We made it back to the Christmas trees again. 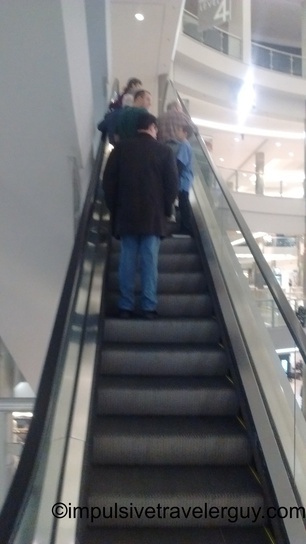 Yet another ride up the escalator to the third floor. 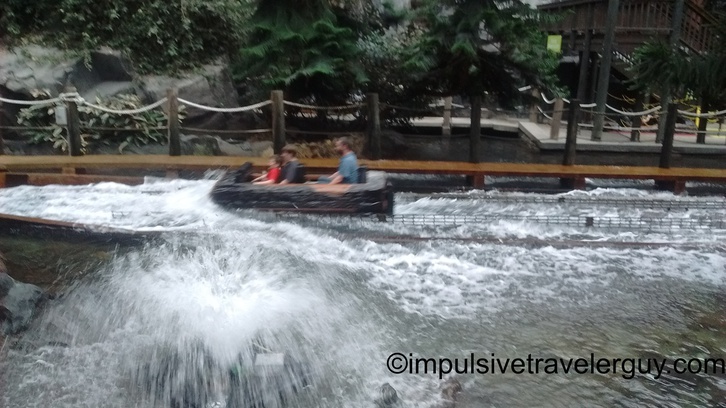 On the third floor, I got another view of the log ride. 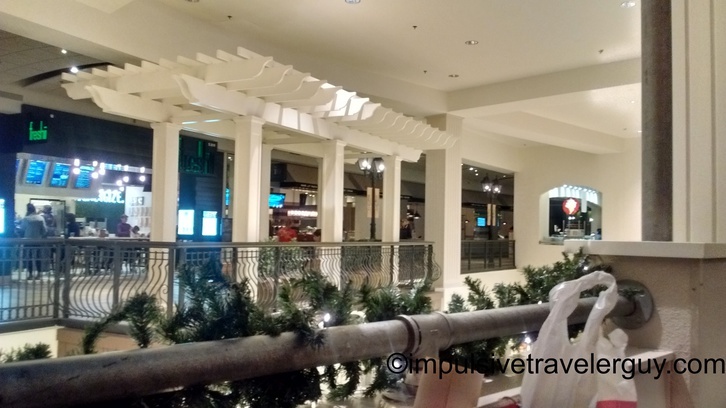 We went by the food court. 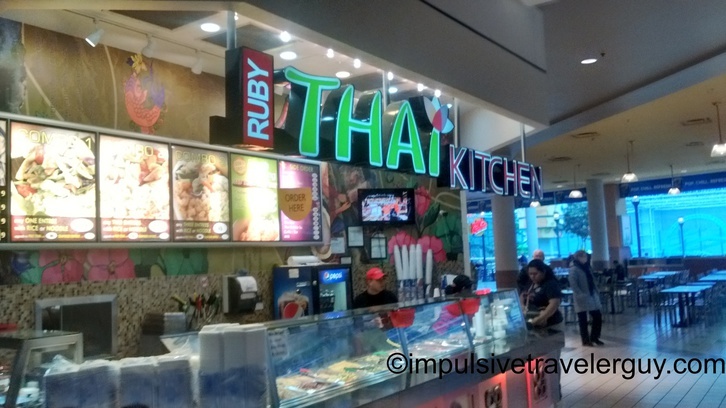 One place I would always stop at when I visited myself is this Thai place. 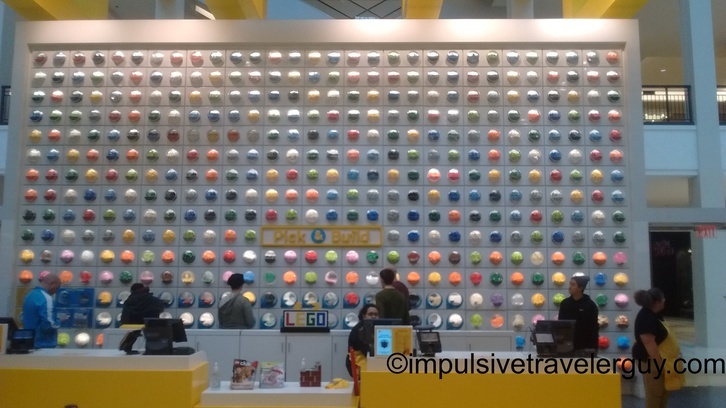 I loved the whole concept of being able to choose what dish you wanted and having it fast food like that. Besides an actual buffet, there is nothing offered like this in Marshfield. 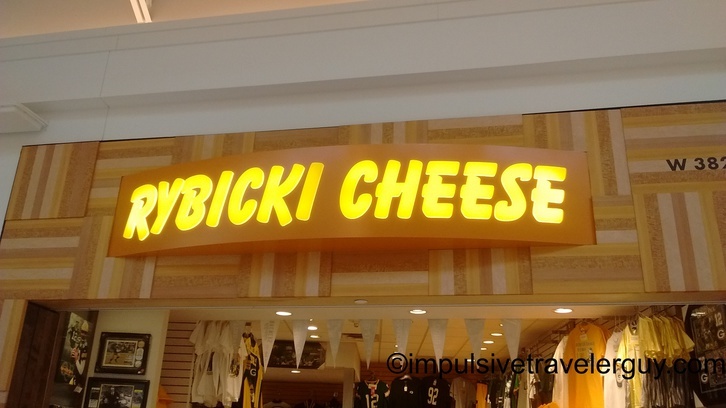 My favorite store in Mall of America is Rybicki cheese. 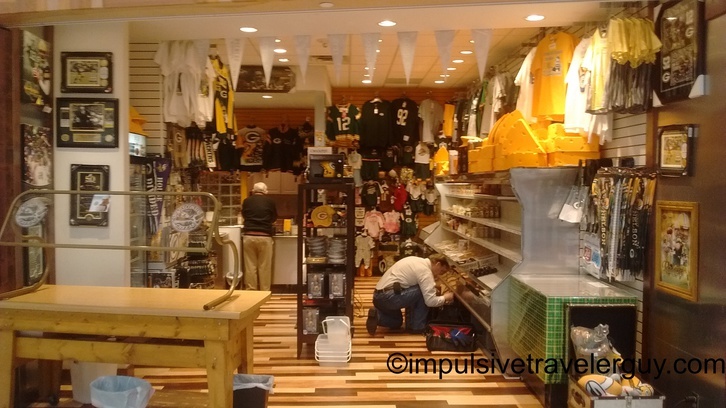 They are a store that sells cheese and Packer’s stuff. 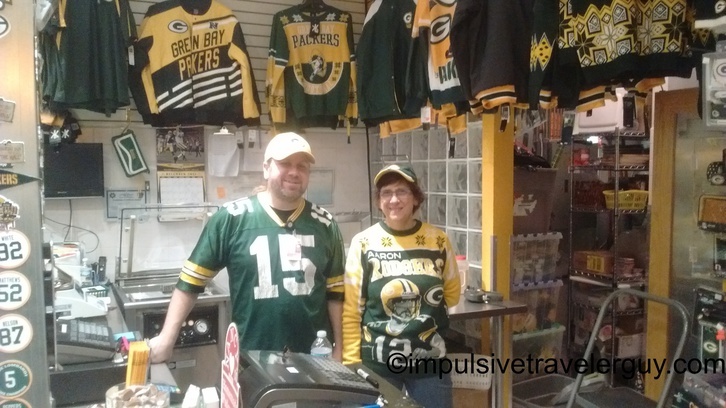 Even their employees wear Packer stuff. 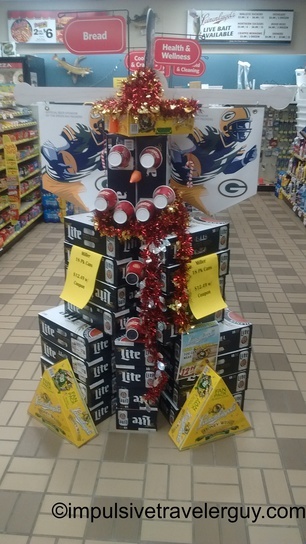 And of course cheer on the Packers! 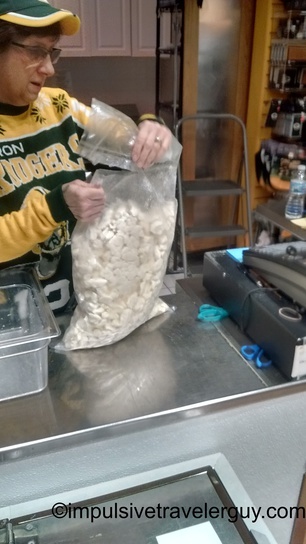 They also have a lot of cheese curds there. They get them from Nasonville Dairy, the cheese factory I used to work at in high school. I remember the Rybicki truck coming to pick up their pallet of cheese curds. The pallet contained 25 pound bags that would then be separated into smaller bags once they arrived on site. That’s exactly what they were doing when I dropped by. 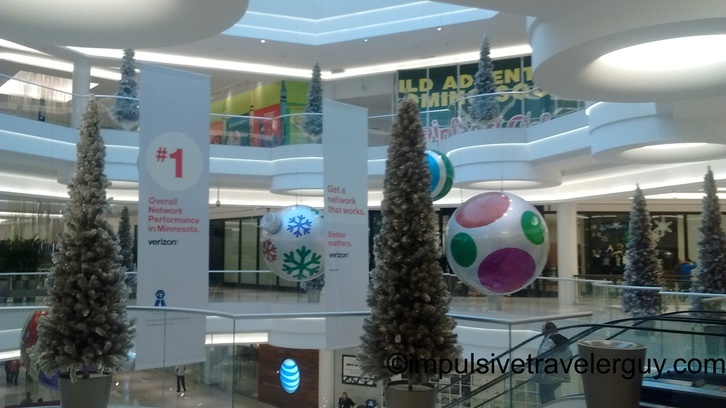 Upon walking a little further, you could see more Christmas ornaments hanging. 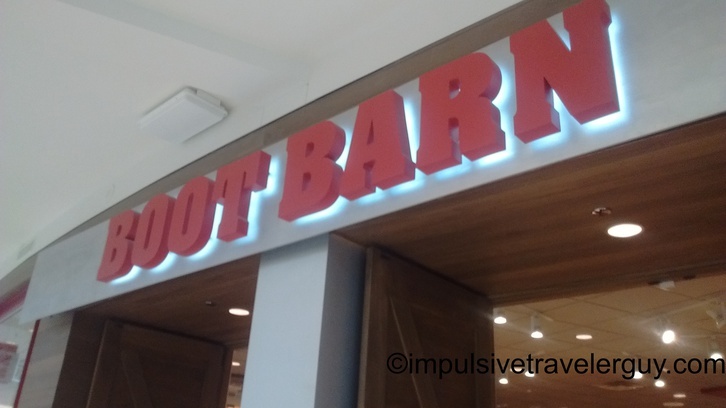 There is a Western Store called Boot Barn. I wanted to see what kind of prices they had. Overall they were comparable to Austin, but obviously not as cheap as Mexico. 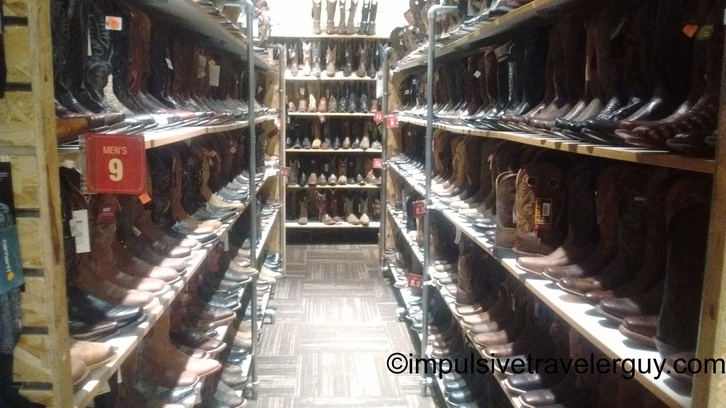 They had a decent selection. I did end up buying some boot cleaner as the salt was doing wonders on my boots. Obviously in Austin we don’t have to worry about salt like the Upper Midwest so I also asked how they got the salt out the boots. 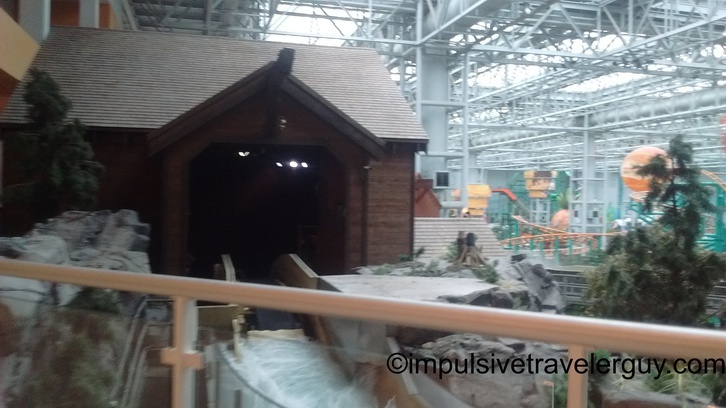 We made our loop around and the last floor was the fourth floor. 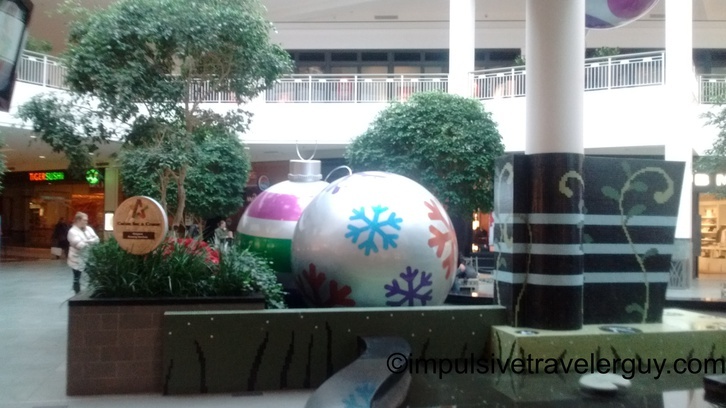 I made it up to the fourth floor and decided to take a picture of the Christmas trees. 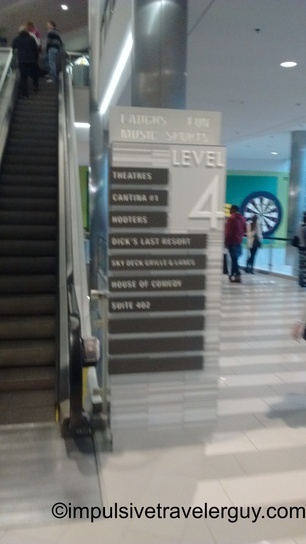 The fourth floor really just has a movie theater and some bars. 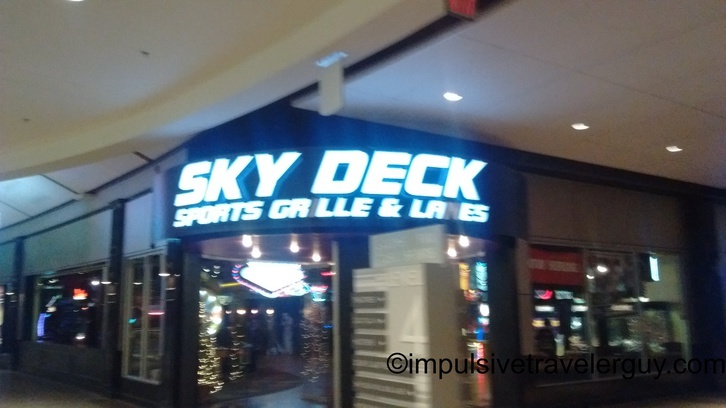 One cool bar is the Sky Deck Sports Bar Grille and Lanes. 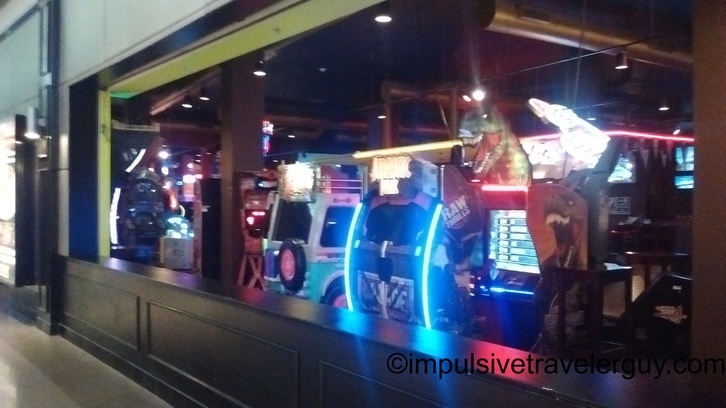 They have a full arcade and bowling alley there. 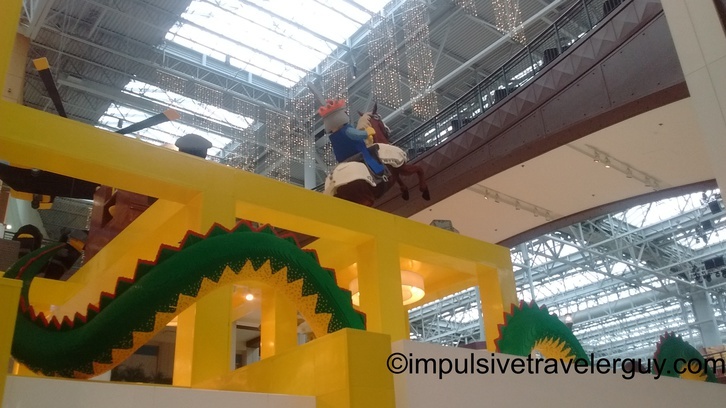 We finally made it around the whole mall. It was now lunch time. 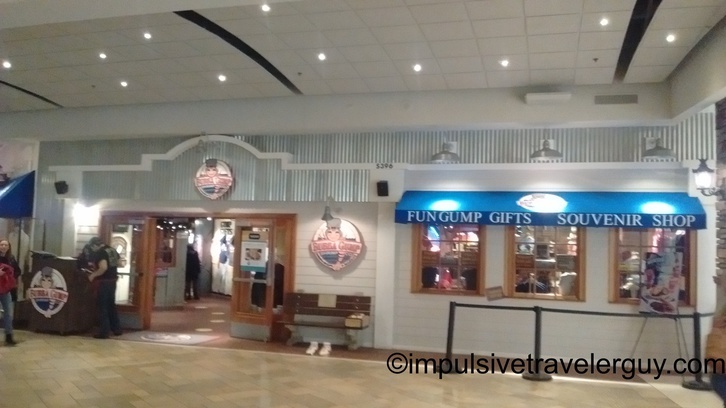 My mom wanted to go to Bubba Gump’s to eat so that’s where we went. 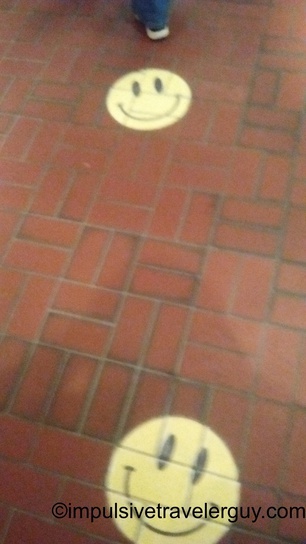 We followed the smiley faces painted in the floor to the main part of the restaurant. Our table had a decent view for people watching. 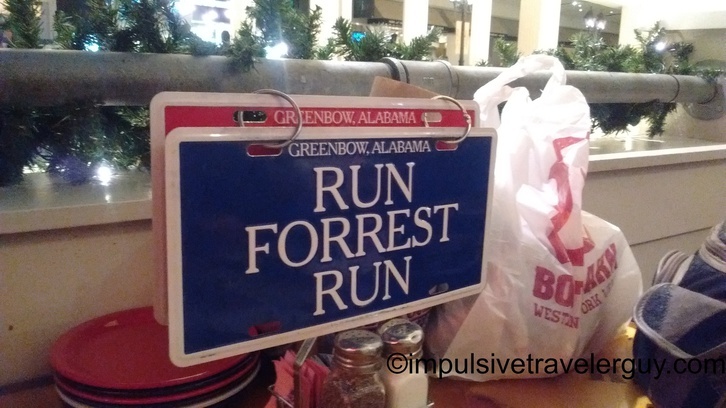 One cool thing about the restaurant is if you need your server, you just flip the Run Forest Run sign to Stop Forest Stop. One of the trivia questions was where was Forest from. That sign was the dead giveaway to that. I know I wouldn’t have remembered if I didn’t see it on the sign. 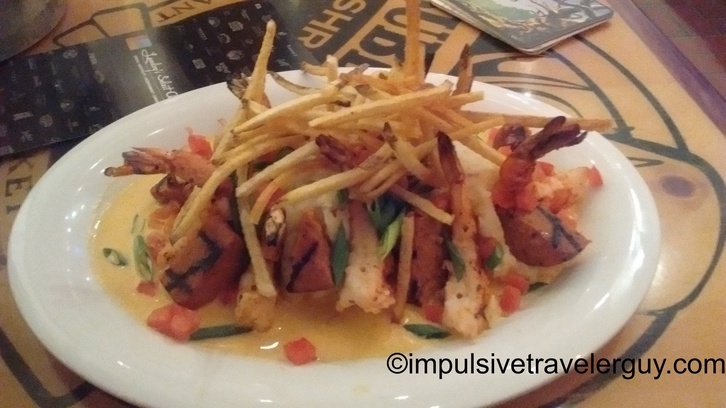 I decided to get Lt. Dan’s Drunken Shrimp. 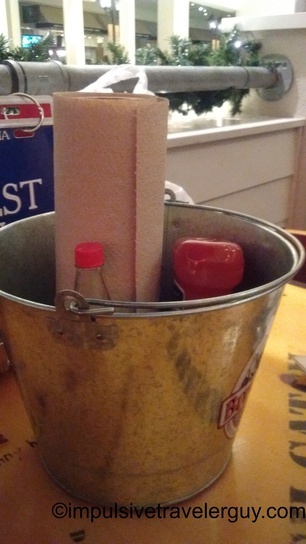 The hot sauce, ketchup, and paper towels came in a bucket. We had a coupon so decided to get the appetizer included with the coupon. 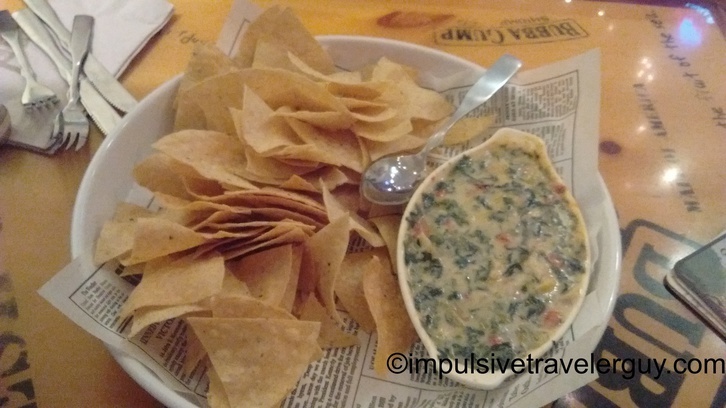 It was Spinach Dip. My mom’s food came slightly before mine. 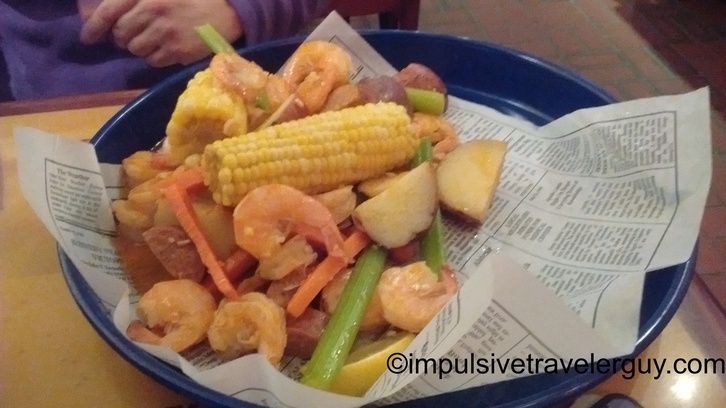 Hers was the shrimp boil. 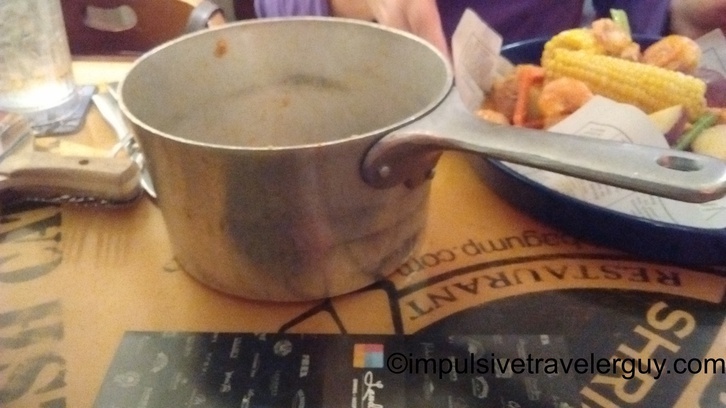 They basically laid it out on the plate right from the boiling pot. My drunken shrimp came out shortly after. After we ate, we decided we saw everything that we wanted to see. The mall was starting to get packed and it was good that we saw everything before the crowds started to take the place over. 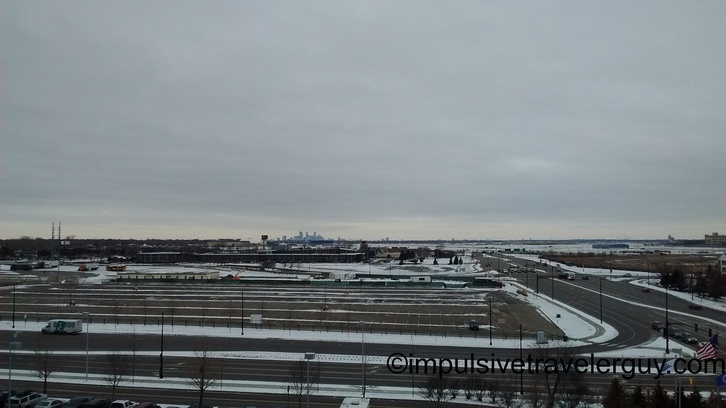 I decided to drive up the parking garage a little more and get a quick picture of Minneapolis from the parking garage. 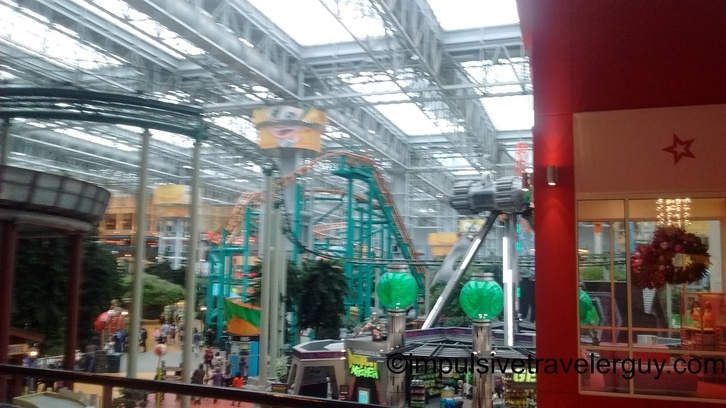 It was fun going to Mall of America and being able to spend some time with my mom. The drive home became interesting but I’m saving that for the next blog post. Below are a few videos I took with my Garmin VIRB X.